Pradhan Mantri LPG Panchayat Yojana is Launched by PM Narendra Modi under PM Ujjwala Yojana to distribute LPG connection and tell advantage & Uses of LPG gas in households. This Pradhan Mantri LPG Panchayat Scheme runs in all states of India where Ujjwala scheme is running. If you have seen any Nukkad Natak, Story teller artist in Roads to give knowledge about social scheme, in that way Village Pradhan, Teachers, Secretary and other people who have keen interest to tell and educate about PM LPG Panchayat Yojana. NIDHI EIR Yojana Application Form in UP for Engineering Students, Apply Online Rs 20,000 to 30,000/- on monthly basis NIDHI EIR Yojana. 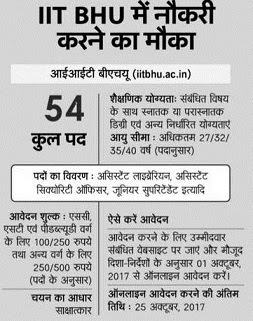 IIT BHU Junior Assistant Recruitment 2017 Form to Fill 54 Vacancies in Superintendent, Technician Librarian. To Apply Online for IIT BHU Jr Assistant reads below.